Which platform is the best for my eCommerce store? What kind of products will I be able to sell? How do I handle shipping fees? We’ve taken a look at what options are available to you, and can provide some insight into what will work best for your store. WordPress (WooCommerce) is an incredibly popular tool for building a website, but there are questions about how well it works for an eCommerce store. It works great for blogs and news websites, but choosing an eCommerce platform is a different story. Shopify, on the other hand, is an eCommerce platform software that lets you build an online store from scratch. Establish a custom domain name, choose a website theme, upload products for sale and manage your inventory. The platform also handles marketing, making it easier for your business to take off upon launching. The primary difference between the two platforms is that WordPress is stand-alone software – you have to download, install, and set it up yourself. Shopify is an online tool; once you set up an account, you’ll get a set of steps to guide you. This includes setting up a domain name and hosting. WordPress, on the other hand, does offer managed hosting plans and these come already installed on WordPress. When you’re running an eCommerce store on WordPress, you’ll need to install WooCommerce (or a similar plugin) to get eCommerce store features. Both platforms offer a variety of designs to choose from. Remember, WooCommerce is a plugin of WordPress, so most WordPress website templates will work with WooCommerce, but not all. Keep an eye out for themes that will work with WooCommerce. Shopify has over 50 templates to choose from, and they are mobile-responsive. More importantly, you can choose different template variations, giving you access to double the templates. 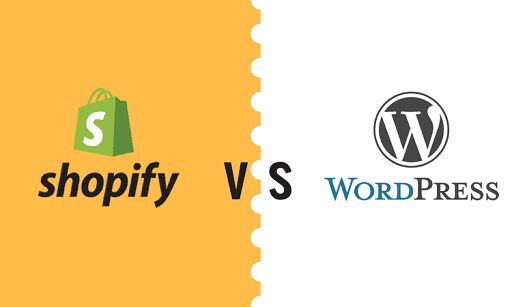 WordPress and Shopify are two very different platforms that come with vastly different price points. WooCommerce is a free plugin that allows you to sell products, calculate flat rate shipping, taxes, and accept PayPal payments. Starting an eCommerce business means you’ll be paying for the theme, domain name, and additional extensions to build your website. If you want customizable shipping options, you’ll have to download the Table rate shipping extension for $199. Some WooCommerce themes are free, but if you want a high-impact website, expect to pay anywhere from $50 to $100 on a single fee. Registering a domain name costs anywhere from $8 to $15 on an annual basis. Web hosting costs at least $30 per month for a WordPress URL. An SSL certificate to secure your website can be anywhere from $50 to $300 per year. Extensions and site-related costs can quickly add up to over $500 per month on an annual basis. A basic Shopify website that includes credit card payments, unlimited products, and a free SSL certificate is $29 per month, or $348 per month before tax. For $79 per month, or $948 per year, you’ll receive extra features like shopping cart abandonment recovery, gift cards and professional reports. Shopify also offers a ‘Lite’ plan for $9 a month that lets you sell products on social media, in person, or on an existing website. Shopify’s options include more features for a fixed rate, whereas the price of WordPress will gradually increase with each extension you add on. Setting up a Shopify eCommerce store is easy. When you visit the website and click to sign up, you’ll go through a basic setup wizard and you’re done. Shopify will even offer advice based on the type of eCommerce store you want to launch. For example, you want to launch a website that will convert visitors into customers, and Shopfiy will guide you in doing that. Once you reach the dashboard, you’ll be able to add new products and build your store. WooCommerce seems easy to use, but once it’s installed, there are additional steps to take to ensure your online store is operating the way you want it to. Streamline the process by choosing a WordPress hosting company to handle the domain and installation of WordPress. It’s one less step, but not as simple as Shopify’s subscription-based solution. When you’re setting up your eCommerce store, there’s a strong possibility you’ll have questions. Shopify makes it easy to get in touch with someone; in fact, you’ll have 24/7 access to customer service via email or by phone. WordPress offers support, but not via email or phone like Shopify. Since WooCommerce is a WordPress plugin, or an extension of WordPress, there isn’t a community of dedicated WooCommerce customer support specialists available to answer your calls. You’ll have to visit their community-based support forums to find the answers you’re looking for. You may also create an account on WooCommerce.com; it has its own support forum where you can ask basic questions, submit a service ticket for a technical issue, or submit a query if it’s a sales question. WordPress is a champion when it comes to building an SEO-friendly eCommerce website. Since it’s mainly a content creation platform, you can download an SEO plugin called Yoast SEO. This tool lets you track how optimized your content is as you write, tells you what is missing (meta description, alt tags in images) and how to improve your content overall. Shopify includes some SEO practices automatically in your online store, including content following a logical hierarchy of categories, and URLs are made standard and simple right away. eCommerce store owners may also use Plug In SEO app. It checks page titles, meta descriptions, website speed and blog structure. While you might rely on SEO tools, it’s important to consistently write engaging, high-quality content that your audience will want to read. Don’t blog for the sake of creating content for search engines to index; each blog should have a purpose. Which eCommerce platform do you choose? Shopify specializes in dropshipping, which lets you sell products you don’t personally stock. WooCommerce lets you do it too, but you’ll need to download and pay a subscription fee for the extension. Shopify offers a variety of themes that are ready to use and gives you the power to design your own eCommerce store without a developer’s help. You won’t need to hire a developer if you choose WordPress either, but you will have to pay extra for the right theme. Easily integrate an offline POS system into your brick and mortar location(s) with Shopify. With WordPress, simply download yet another extension and pay for it. Shopify is a great eCommerce platform to consider if you need assistance building an online store by yourself from start to finish. Shopify has built-in tools to track your inventory, shipping, taxes and more. You want to set up an eCommerce store quickly. You don’t have any web skills and cannot hire a professional. If your goal is the online and offline integration. If you want access to customer support. It doesn’t matter what type of product you want to sell if you’re running an eCommerce store on Shopify. It also doesn’t matter what shipping options you prefer. No matter how small or large your inventory is, Shopify will ensure you have everything you need to start selling from the moment your new business launches. Should you choose WordPress at your eCommerce platform of choice? If you’re launching your first eCommerce store and want to have complete design control over how your online store looks, then WordPress is right for you. It’s a powerful platform when it has all the plugins you need installed. Since WordPress functions as a blog, it will be easy to edit and update content to your website in an efficient manner. Use the Yoast SEO plugin often to ensure your content is always optimized for search engines. If you already have a WordPress site and are familiar with its functionality. If you want to keep your startup costs to a minimum. You are prepared for minimal, reactive customer support as you explore WordPress eCommerce website design. Choosing the right eCommerce platform to build your online store on is not an easy decision. Take the time to research both platforms and identify what you need out of your platform (convenience, support, ease of use) before committing.